If you have been given permission to create new content in a CMS Section, there will be a "Create New Article" button in the top right corner of the screen. Press this button to load the Article Editor. Right now there isn’t a way to save a rough draft of your article. But, you can use the Publishing Date and Publishing Time fields in the article form to delay the date the article is published to the public. This will give you time to go back to change and revise your article before it appears in its assigned section. Check to see if you are in the right section. Check to see if the permissions for the section have been set so that only a certain group of users can see the section. If it is, the article will not be made visible to the general public unless the “preview” option was selected at creation. Check to see if your article has been published. 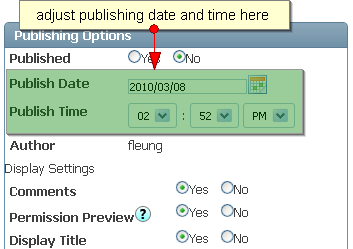 Check to see if the “Start Publishing” date was set to either a date before today or today’s date.